The Taco Viridian VT2218 is a temperature sensing, variable speed circulator ideal for Delta-T or setpoint temperature applications. The VT2218 is whisper quiet and has a big, bright LCD screen that's easy on the eyes. Simple push-button navigation lets you set the pump to any one of five modes quickly and easily. But what you can't see is just as important: our innovative Bio Barrier protects the rotor and bearings from system contaminants. 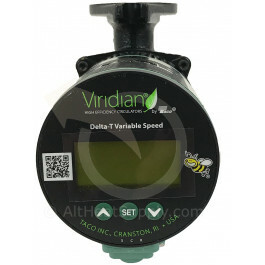 The Viridian VT2218 can slash fuel bills by hundreds of dollars. Its companion, the Zone Sentry zone valve, draws up to 93% less energy, uses fewer components, and can handle up to 12 valves per standard 40 VA transformer. When it comes to zone valves, the Zone Sentry is the smartest decision you can make. Typical uses include hydronic systems zoned with zone valves, radiant loops, injection pumping, snowmelt or hydro-air fan coils. Can also be used in constant speed mode for zoning with circulators, indirect water heaters or primary boiler loops. • Equipped with a cast iron casing and should be used for closed loop systems only. • Acceptable for use with water or maximum of 50% water/glycol solution. Operating mode, speed or temperature setting, watts, gpm, supply temperature, return temperature, and error code diagnostics. • Use with a Taco ZVC Zone Valve Control or SR Switching Relay for ON/OFF operation.